About the meaning: Firstly, many (if not most) readers interpret the Letter exclusively as the card of written (or at least non-face-to-face) communication. I started out with that, too, and I still include it in my interpretation. But I soon found that reducing the Letter to written communication only made the card more or less useless for my own readings. So I expanded my range of interpretations a bit. Especially the last paragraph of the following interpretations is the reason why I now look for the Letter immediately when I ask about an interpersonal problem. Communication in all its forms / information: As I said, many people interpret the Letter as written communication only. I don't. For me the Letter represents communication in general - written communication, yes, but also verbal and non-verbal. To me, the Letter may represent letters, emails, and documents, but also, and more useful for my readings, conversations or long enduring communication processes. I can even see the Letter representing hand-gestures or facial expressions that are made with the conscious intention of communicating something to others. As representative of a person the Letter can stand not just for your letter carrier (which is a very obvious but hardly useful meaning) but for any person who is communicative or who you are currently in a communication process with. And applied not to people but to objects, "communicative" can also mean anything which is expressive or meaningful (e.g. very expressive music, or meaningful paintings, or clothes which are worn to highlight their wearer's status/role etc.). Another aspect of communication is that it is a process in which information is imparted. So, while the Book to me is the card of truth, of facts, of knowledge, the Letter represents information - facts which are being shared. So when I draw the Letter in a reading I sometimes interpret it as some bit of information that I should acquire from someone, or which I already have but should share with someone else. 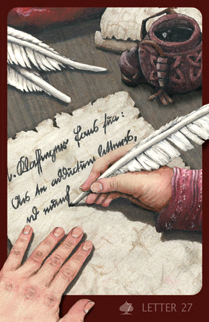 Communication or conversations with a certain degree of depth and effort: Communicating through a letter, through written words, takes time and effort. This was the case especially in the time when the Lenormand cards were created, where it could take weeks or months for an actual letter to arrive at its destination. But even now, a "modern letter" in the form of an email, is still one of the most elaborate and time-consuming types of communication available. So I at least sometimes interpret the Letter as communication which has depth, which takes effort, or which goes on for a prolonged period of time. The Letter might also mean that the content of the communication is quite relevant - emotionally, or because the information shared in it is important. To communicate something / something should be expressed: Finally, the most useful interpretation of the Letter to me is that it represents something which is being communicated/reported/expressed or which should be expressed. The Letter can mean that something is talked about, that some information is being shared, that something is being or will be reported. In that last sense, the Letter also is the card of the informant or whistle-blower! But, depending on context, the Letter could also mean that all this is not happening but should happen. It can mean that some information should be shared with others; that some feelings or hopes or fears should be expressed for our own or for other people's benefits. In this sense, the Letter to me is the card which says "Just talk about it!" or "Let them know!" or "Express your feelings!" The Letter can mean that we have the longing to speak openly about something (and not keep it to ourselves anymore), or that we have the responsibility to let others know about something. It can indicate that expressing something - be it a thought or a feeling - could be very healthy, or at least, that not expressing it is detrimental. By the way, the expression of something doesn't necessarily have to be verbal. For example, someone might express grief through crying, or anger through shouting, or the appreciation of another person by doing something nice for them. For most readings, the Letter seems to suggest that expressing something would be a positive thing. But sometimes, depending on the cards which surround it, the Letter can be a warning not to over share, or to find other, more productive ways to express ourselves. See also the annakblogs article >> So, is the Letter a positive or a negative card? About the Image: Because I hardly ever interpret the Letter as written documents but much more often as the process of communication, I painted someone who is in the process of writing a letter. Also, there's an ink pot in the background as well as some spare quills and parchment and red sealing wax. If you wish, you can view those as symbols for the fact that in order to communicate something successfully, we need not just the willingness to communicate. We also need certain props - physical props, as shown in the image, but metaphorically speaking also certain linguistic, social, and mental skills.